Dual Band GSM & 4G LTE Booster – 1000 sq.m. 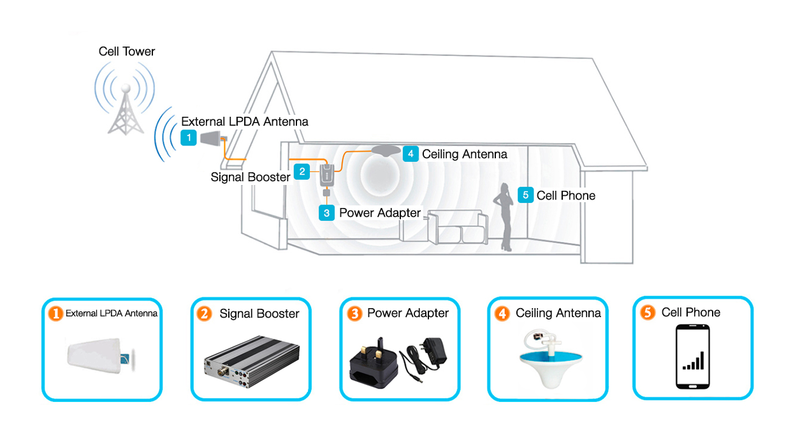 Our Dual Network signal booster provides coverage up to 1000 sq. m. This is ideal coverage for a big house, large office, bar, café, restaurant or similar size establishment. It will boost all majorIrelandoperators’ “voice” and 4G network signals from Vodafone, Eir (Meteor), and Three in the 900/1800 MHz frequencies. Our Dual Network signal booster works well with your 4G network service in 900MHz/1800MHz frequencies. You can get a “5-bar” signal throughout Ireland using our dual band repeater. Boost Vodafone, Eir (Meteor) network operators’ signal with help of this device. 1805~ 1880 MHz AC:90~265V, 50/ 60Hz;DC:5V 2A 200 x 120 x 38mm 1.8 KG. The instructions were in quite poor English. It took me a while to work out what I had to do. Thank goodness the helpline was there to explain everything. It would be better to have a clear manual in the first place though. Not bad at all. I was hoping for a couple of bars increase and that's what I got. That'll do for me. There's nothing I don’t like about this product. It was affordable, it's effective and it was delivered really quickly. When I read that this was going to give me a full 5 bars I couldn’t wait to try it, but I found it didn't work quite so well for me. I get around 3 which is an improvement but maybe my expectations were too high. Highly recommended! Should be noted that as many others have said, you do need signal outside for it to work inside. What more do i need to say, it works! I used to get one or sometime no bar at my house, but now i get two bars around the device. Just wish the booster can reach longer distance. We have this amplifier in our office - all four of us are on different networks but we all get the same improvement in service. so simple even I could use it! I'm not the most tech-savvy person I know but even I could get this device working! I would recommend this device to people looking for signal boosters. Finally, no need to worry about obstructions that may interfere with my phone’s signal. Bought about One year ago. Followed Directions and Product Increased reception from 2 bar 3g to 3 bar 4g. Had 1 of the 2 coaxial cable not working, tech support sent me a replacement immediately at no charge.Since then I have had no problems. Easy website helped me to select the right. Impressed by the fast shipping! Dual Band GSM & 4G LTE Booster - 1000 sq.m. Dual Band booster is an ultra-fast functional high-quality booster supporting 900/1800 frequencies with major Ireland mobile operators.